A Druze farmer is preparing his fruit and vegetable shop in the heart of the occupied Golan Heights. The white hat symbolises the strictly religious piety. In the wake of the war in 1967, Israel takes the Golan Heights and thus secures the water supply for its citizens in the same breath. The occupation took 120,000 Syrians their land, they have fled from the military power, forced or by own choice. Only 5 villages remain, the 5 villages of the Golan Druze. More and more Druze who live on the Israeli-controlled Golan Heights now starting to accept the offer of an Israeli passport. In the largest city there will soon be elections for the first time, as the Israeli government announced. These Druze say Israel can help us more than the belief in a return to Syria. The future of the Golan is uncertain and a peace agreement is not in sight. The inhabitants therefore hope to be in a good position by education in any state system. This has worked in their history as a minority so far with any power over you. But education and the open cosmopolitanism of Israel are driving many Druze to question and redefine the knit Druze identity. What is my religion and nationality worth to me? Portrait of Ali Abrahem Awidat, even at his age of 96 years, he is walking daily from Majdal Shams to his farm around 4-5 kilometre away, to take care of his land and the fruits. An restricted area near an army base of the IDF on the Golan Heights. According to the Al-Marsad Arab Human Rights Centre in Golan Heights, 2000 landmine fields in the occupied Syrian Golan are still active. Minefields are mostly found in grazing areas, agricultural land, along the ceasefire line and in nature reserves. However, most concerning, they are also located within or close to Syrian villages, representing significant danger to the population. This danger is magnified when snow and heavy rainfall causes mines to become dislodged. Amir, a so-called „Sheikh“,a religious Druse, like many other works with his family in a vegetable distribution and owns a small supermarket in Majdal Shams. The geography of the Golan Heights is known for its abundant fertility. This is not only the reason for the high standard of living of the Druze, from them come also the majority of the fruits consumed in Israel. The white headgear reveals the religious affiliation of the Druze. Portrait of a apple farmer next to a painting displaying the heritage of the Druze community in Masadah. The Druze religion and heritage says the community has the duty to first fight for their land they live on and then for other belongings. The Druzes do not recognise any religious hierarchy as common in the other big monotheistic religions. As such, there is no "Druze clergy". But there is an initiated religious group, so called "uqqāl", which includes both men and women (less than 10% of the population) who are allowed to have access to the Druze holy literature, wearing commonly the white cap and black dress. Although the rest, so called "juhhāl", are not granted access to the Druze holy literature or allowed to attend the initiated religious meetings of the ʻuqqāl. Water tanks next to Mount Hermon on the border of Syria and Israel || Occupied Golan Heights; February 2018.
they are „accepting“ the occupation by voting as a part of the Israeli system. Overview of Majdal Shams, the biggest village of the Druze community with the border to Syria in the background. Majdal Shams, the largest of the 5 Druze villages, is located directly on the border with Syria. 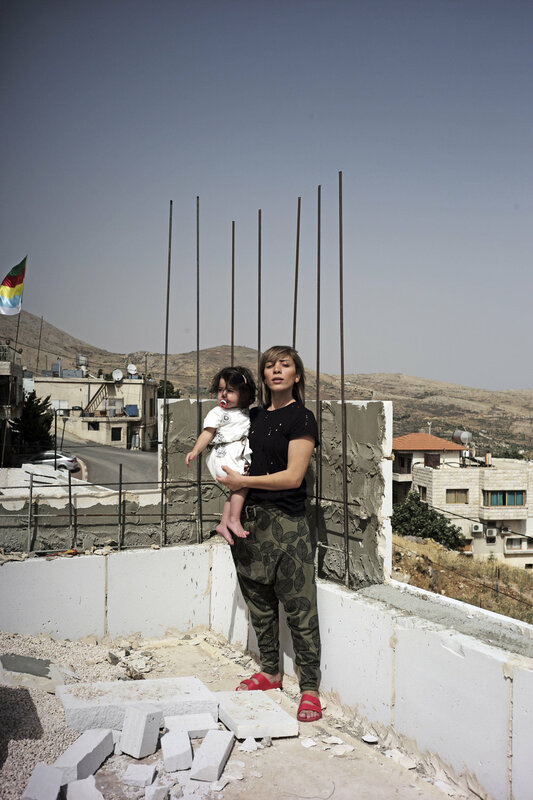 The city, which has a population of about 10,000 inhabitants, was separated by its relatives living in Syria as part of the occupation of the Golan Heights by the Israelis. Today many houses on the Syrian side are still in property of the Druze on the Israeli side. Getting there now is impossible. A Druze farmer walks through his garden. After IDF jeeps went through the fresh planted trees, seeking a lookout, destroying all new crops, he thought it won`t happen again, if he closes his gate via lock. But the night before again military jeeps went through his garden. This time he will try to put a stone in the entry and sue the young soldiers for destroying his garden, he said. The border between Syria and Israel which was upgraded during the ongoing Syrian Civil War. Water flows from the Syrian through the border into the farm side offering the farmer industry in Israel most of the usable water supply. As well as the water flows into the Jordan river, finally ending in the Dead Sea. back to her home to stay. Especially in private living rooms the Syrian heritage, identity and a connection to president Bashar Al-Assad is highly visible. 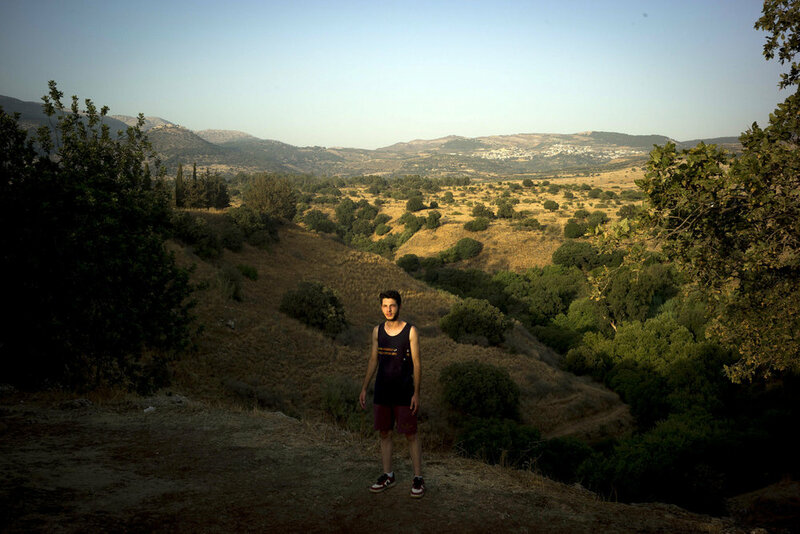 Especially because families have been separated through the wall between Syria and Israel, people look forward to follow one side, blaming the other for the situation. Above: Old passport as a memory from the former time. The ruins of „A Fed“, a former Syrian village on the Golan Heights. With an estimated 130 thousand people forced to leave the occupied Syrian Golan and unable to return, the Israeli military was, for the most part, unopposed in its administration of the newly occupied territory and began a widespread campaign to destroyed numerous villages and farms. According to recent research, 340 villages and farms were destroy- ed, leaving only Majdal Shams, Masada, Bqa’atha, Ein Qynia, and Ghajar, five small villages in the valley of Mount Hermon. Starting one week before, neighbours and visitors show up at the families house of the upcoming wedding in Majdal Shams. Especially the visit of the religious leaders is a moment of acceptance of the wedding from the religious side. A mother with her son walks next to a religious Druze women, wearing the white scarf, at evening to a wedding nearby, July 2017. The difference between pious religious and secular Druze is almost everywhere visible. Druze community attends a big wedding in Majdal Shams, July 2017. Especially on weddings the Arab tradition and background is visible. Here for example the women section. But as the evening goes by, time to time a man comes over to sit with his wife and watches the event. Young Druze people attending the opening of the „Atelier“ on July 2017. The bar shall give space for artist to present their work and to enjoy the evening by a beer and music. Friends and family dancing the Arab-Palestinian dance „Dabka“, preparing themselves for the upcoming wedding in about a week. Portrait of Jaber with the Golan Heights in his back. Jaber kind of fled from his parents house because of a fight about his way of living, doing music and like to smoke cigarettes. He went to his friends in Haifa and stayed there until the situation got calmer. Portrait of Farhat (r.) and his brother Slim in their tattoo shop in Buq‘ata a smaller more conservative village. The brothers will open up a second tattoo shop in Majdal Shams. Especially from the conservative religious Druze side, the brothers get criticised harshly, because in Druze believe tattoos are not allowed anytime anywhere. Portrait of Moneer Awidat sleeping at his parents house in Majdal Shams. Moneer was on of the managers of Tel Avivs biggest club, „The Block“, he is a good example for a young Druze deeply connected to the Israeli lifestyle, but still living during the week in Majdal Shams, his hometown. His plans are to open a own new club in Majdal Shams, but the still conservative society seems to be against it. Moneer and his friends enjoying their freetime at the Lake Ram. The Lake is one of the tourist hotspots, where Jews, Muslims and Christians gather in the summer to enjoy the nature of the Golan Heights. Israeli students. This is in part due to the unusual categorisation of Syrians from occupied Golan as having an ‘undefined‘ nationality.